The St. John's Advent Giving Tree supports those in need across various ministries at St. John’s which include the following. Haiti Mission — Assists with monthly contributions to our sister parish in Haiti. Pro-Life Ministry— Supports a pregnant mother and her family in need through the Gabriel Project. St. Vincent de Paul— Supports those in need locally in Indy. 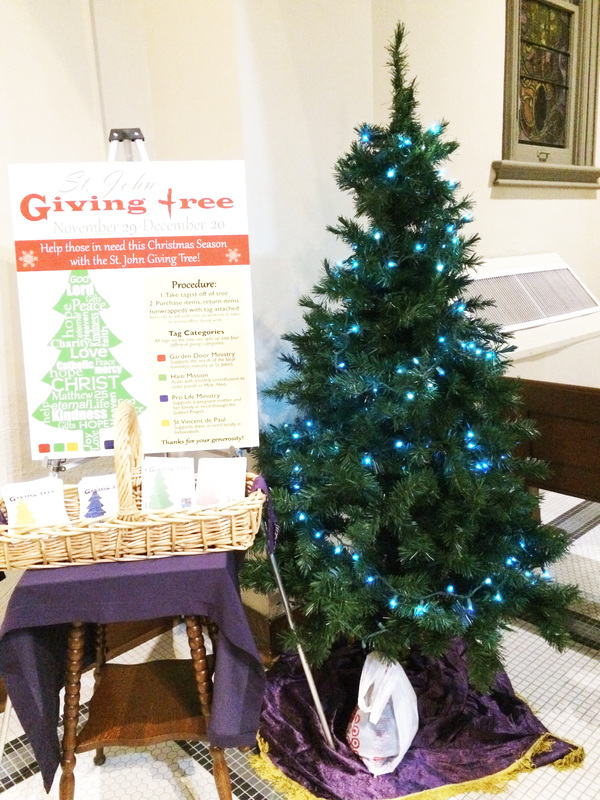 ​The St. John’s Advent Giving Tree will run through December 20 and is located in the St. Anne Chapel inside St. John's Catholic Church. See the tree in the back of church for more information or to grab one of the tags off the giving tree. Thanks for your generosity to those in need this Christmas season! Questions on the Giving Tree or want more information? Contact Josh Schaffner.